If the long wait for a haircut at the Harmony Barbershop has kept you from getting your haircut we have good news. According to Stitch Kingdom the Barbershop will begin taking appointments. While this might not please those who are unaware of the change, it should be good news for those who like to plan ahead. Long lines typically form outside the barber shop. The Harmony Barber Shop is open from 9am-6pm daily. Cuts for adults are under $20 and cuts for kids are $14. Walt Disney once said that his parks were not intended to be museums, but that they should be constantly changing and evolving, so it should come as no surprise that the Main Street, U.S.A. that we enjoy at Magic Kingdom today is substantially different than the Main Street, U.S.A. that debuted on October 1, 1971. Although the Main Street skyline has remained largely consistent, the composition of the shops inside has varied over time. The overall look and feel of the area has changed as well. 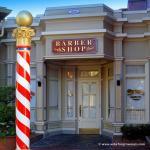 The Harmony Barber Shop on Main Street U.S.A. Sit back in the old time barber's chair and get ready for a good old-fashioned haircut at Harmony Barber Shop on Main Street, U.S.A. in Magic Kingdom. Many Disney fans know that the Harmony Barber shop on Main Street USA is a great place to take your kids for their "first haircut," what fewer know is that there are plenty of services available for adults as well. If you're looking for a new, unique Walt Disney World experience, why not add a trip to the Harmony Barber Shop to your list? Main Street, U.S.A. is the first "themed land" inside the main entrance at Walt Disney World's Magic Kingdom and other Disney Parks around the world. As you walk beneath the train station overhead, you cross through a portal to another time. You notice that there's a Victorian theme throughout Main Street, yet the architectural styles represent several distinct areas of the country. Did you know that you can get a haircut in the Magic Kingdom? The Harmony Barber Shop is an actual, functioning barber shop that guests can visit for a haircut or a beard and/or mustache trim.